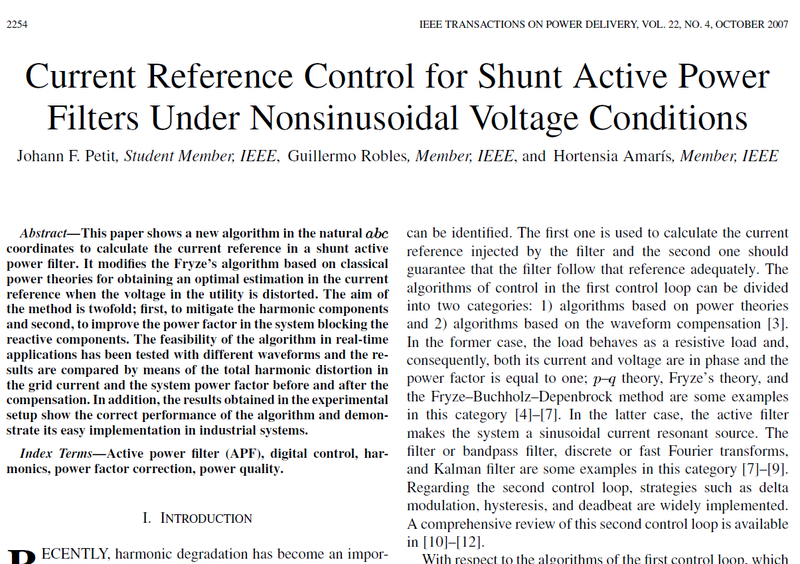 Abstract – This paper shows a new algorithm in the natural a-b-c coordinates to calculate the current reference in a shunt active power filter. It modifies the Fryze’s algorithm based on classical power theories for obtaining an optimal estimation in the current reference when the voltage in the utility is distorted. The aim of the method is twofold; first, to mitigate the harmonic components and second, to improve the power factor in the system blocking the reactive components. The feasibility of the algorithm in real time applications has been tested with different waveforms and the results are compared by means of the total harmonic distortion in the grid current and the system power factor before and after the compensation. In addition, the results obtained in the experimental setup show the correct performance of the algorithm and demonstrates its easy implementation in industrial systems.